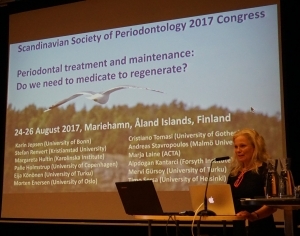 Is it time to rethink the use of antibiotics to treat periodontitis? Millions of lives have been saved by physicians since the first antibiotic was deployed for use in medical therapy in 1935. But the golden era of antibiotic discovery is over, antibiotic-resistant superbugs are a serious problem today. Randomized clinical trials and systematic reviews with meta-analyses have clearly established that adjunctive systemic antibiotics, combined with mechanical debridement, offer clinical improvements additional to those obtained with scaling and root planing alone. These effects are more pronounced in aggressive and severe periodontitis, whereas limited additional improvements have been observed for moderate disease. At the same time it has to be realized that an increasing number of warnings have been articulated against the unrestricted use of antibiotics in treating periodontal diseases because of the emerging global public health issue of bacterial resistance. In conclusion, the slight additional benefits of adjunctive antimicrobials, which were shown for moderate forms of periodontitis, have to be balanced against their side effects and therefore their prescription should be limited as much as possible.